A few years ago, when The Honorable Anne Simon decided to write police procedural novels, a series of books with "Blood" in the titles, she launched a career revealing her talent as a writer that equaled her success in the field of law. In this month's publication of the third novel in her series, Blood of the Believers, she continues to showcase her talents as a writer based on her experiences in the legal field. She delivers a rich, well-plotted novel that holds the reader in suspense with two homicide investigations which take place in Acadiana, her adopted home. "Shaded by a canopy of drooping willow trees, a flat-bottomed bateau plied the shoreline of a narrow bayou leading from the south end of Catahoula Lake. The prow of the wooden boat poked in and out of stands of cypress knees protruding from dark sludge at the water's edge. Sitting on a plank in the stern of the bateau, an old man nudged the tiller to the port and starboard, his gnarled and sun-browned hand controlling their course. An outboard motor purred behind him..."
"in varying stages of construction [covering] the surface. Cloth bodies, china heads, and bins of sewing supplies — material, ribbons, and buttons — spilled from the shelves of china cabinets along the walls. The second doll room showed off the finished products, groupings of the most elaborately dressed examples of the collection. Probably fifty little ladies in satin dresses had at hand their imagined needs: miniature tables, chairs, utensils, carriages for their babies..."
At the latter scene, another body of an unidentified black male is discovered, and Simon is off and running, involving the reader in two investigations by Ted D'Aquin and his partner Lorraine LaSalle, with the assistance of District Attorney Dennis Byrne. The novel features a complex plot involving the two criminal cases; in addition, an ongoing search for D'AQuin's wife, a probation officer who disappears while making a routine visit in the field, provides an intriguing side story. Simon is convincing in her ability to achieve a unified story with the cases at hand, including a surprise finale. When I read Blood of the Believers, I was mesmerized by Simon's well-paced prose and her facility to create the tension that identifies a superb crime novel — I thought of Ruth Rendell and P.D. James, who have given readers first-rate novels that move us through suspense-filled yarns rich with allusion and clever plots. Simon's familiarity with police procedure and the courtroom serve her well in creating the kind of high excitement Rendell and James achieved in their crime novels. As another adopted daughter of Acadiana, I appreciate Simon's colorful descriptions of the bayou country that equal her predecessor, James Lee Burke — also, her deft touch in creating unusual personalities and locales of Acadiana; e.g., Brother Noah Norbert of the "Church of the Blessed Believers," one of the characters who enhances the intricate plot. "At the front of the room, a tall white man wearing an electric blue robe with a white cross emblazoned on the front stood on an elevated platform behind a podium. Like the statue of Christ above Rio, he held his arms spread wide...Stage right, a dozen men and woman with a range of skin tones swayed in a syncopated rhythm as they hummed a dirge....a ten-foot-square banner on the wall behind the podium proclaimed 'Let the Believers Testify to His Glory'..."
Because of the numerous characters who move in and out of this tense novel, a List of Characters is included in the preliminary pages of Blood of the Believers, and several maps assist readers in identifying crime scenes. The arresting cover art was done by New Iberia artist, Nan M. Landry. Hopefully, this brief review will titillate followers of Simon's "Blood Series" to read the latest compelling novel in which Simon is at her suspenseful best. An absorbing and well-written read by an author who has an unusual way of looking at cases, but respects authenticity. Spellbinding storytelling. Anne L. Simon was born in the East, educated at Wellesley, Yale and Louisiana State University Law Schools, practiced law with her husband Jerry, raised a family, and became the first female judge in the area. Now retired, she travels, enjoys family near and far, takes long walks with her dog, Petey, and writes. Published by Border Press Books, P.O. Box 3124, Sewanee, TN 37375 and at Amazon.com. 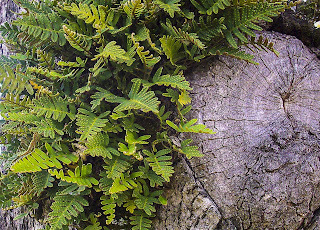 In the spring before Easter resurrection, the old live oaks in New Iberia, Louisiana begin to show large clumps of fronds unfurling that become green and show signs of new life – the resurrection fern, an epiphyte fern that clings to its host tree branches, comes to life, and to me, it is symbolic of the resurrection of Christ. During dry, winter periods this epiphyte fern becomes a grayish brown and looks as if it has shriveled up and died. However, the plant can lose up to 97 percent of its water content and stay alive. A few rain showers lately have caused the fern to unfurl and transform into the bright green that forms on our old oaks. 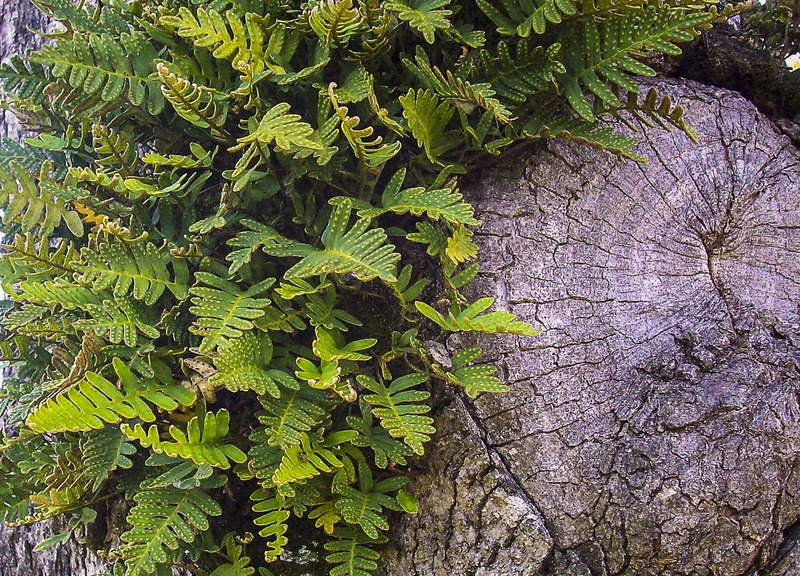 Some plant experts say that the fern can stay in a dried-out state for 100 years. In 2014 when I was writing Between Plants and People, a volume of poetry about the interrelationships between people and the plants around us, I asked Dr. Victoria I. Sullivan, a botanist, to take photographs of the plants I wrote about for the book. At the time, I was spending my half year on The Mountain in Sewanee, Tennessee, and Sewanee was experiencing a gracious plenty of dry weather. When I decided to include a poem about resurrection fern, we searched every habitat on The Mountain and couldn’t find a “model” for the poem. We finally decided to drive some distance to Savannah, Georgia to find this fern that reproduces by spores, not seeds. We knew that Savannah has a plethora of old oaks — also, we were often known for suddenly deciding to embark on a trip just to recover a detail for our writings, or to satisfy a yen for peaches or apples… we were called to live up to our rep for uncovering serendipity on such trips. We walked through the streets of Savannah and finally found a dried up specimen on a venerable oak in the parking lot of a legal firm where we were chased out by a guard but not before we had taken a few quick snapshots. We then drove back to Sewanee. The trip clocked out as a twelve-hour round trip, and when we had recovered, we were told that a patch of the fern grew on a tree not more than five miles away from Sewanee! It was bright with green life, and the intrepid botanist took a photo. Both the green specimen of the fern at Sewanee and the un-resurrected fern in Savannah appear on a page of Between Plants and People. The resurrection fern is an amazing plant, and when spring rains begin to fall, or at Eastertide, you might want to look upward at topmost tree branches of our ancient oaks to witness an awe-inspiring resurrection. This member of the plant world has withstood many droughts and seeming-deaths but remains alive and healthy. I’d say there’s a message therein! After the rain last night, the weatherman predicted a cloudy day, but the sun is shining and my thoughts turn to a cache of gold I saw today in a ditch—butterweeds blooming in a large colony. These robust flowers that belong to the sunflower family had been ignored by the wild and crazy mowers that destroy highway wildflowers, and I'm happy I saw them bloom before I depart for The Mountain in Tennessee. Last week, we brought a cluster of them indoors, and they lasted for a week, a lengthy stay for wildflowers. The sunflower family produces some of the cheeriest blooms in the plant kingdom. I remember when my friend, Janet Faulk-Gonzales, decided to cultivate a field of sunflowers, designed a special card advertising them as "Radiant Faces," and sold them at the open market in downtown New Iberia, Louisiana for a short spell. As she was the sole caretaker for this agricultural project, she closed her business after farming one season of blooms. She decided that watering and weeding chores were too demanding as a "moonlighting" job. Although sunflowers enjoy good press, butterweeds are regarded as noxious plants in some states; e.g., Ohio. Such prohibitions don't affect this wildflower's will to endure in other states, and in the early spring, our Louisiana mosquitoes stay busy pollinating them. (By the way, only the male mosquito feeds on nectar.) Also, the blooms of butterweeds are sometimes used in making dyes and are useful as well as beautiful. Back in the late 70's, my botanist friend, Dr. Victoria Sullivan, who has notebooks filled with unpublished poetry, published a snippet about butterweeds in the Connecticut Fireside Review. This snippet is a better response to sighting a field of golden butterweed than this blog. anxious to give some bee a tumble. In Tennessee, I've mistaken a field of rapeseed for butterweed, but the former belongs to another family of flowers cultivated and used for Canola oil. The sight of a sheet of the rapeseed in bloom is as pleasing a vision as the butterweed, so I'll have the opportunity to see another field of gold soon. P.S. Happy International Women's Day. Enjoy your day off! You can see I'm honoring the suggestion to refrain from labor today by creating a shorter blog. This week, I received the first copies of Sifting Red Dirt, my poetic offering for the year 2017. The cover, as usual, is a photograph of the unique glass work of Karen Bourque, a glass artist in Church Point, Louisiana. When I look at the beautiful glass pieces Karen renders to be photographed for the book covers of my poetry, I feel especially blessed to have her artwork in my home and on the book covers. "Last year I published a book of poetry featuring my Cajun ancestors about whom I had no knowledge until I reached my forties, and after the book, A Slow Moving Stream, appeared and I gave several readings, my maternal ancestors began to rival those paternal ancestors for inclusion in a book. They appeared in old photographs I had put away, in dreams, and in cogent memories...So I went to Mississippi where my great grandmother, Dora Runnels Greenlaw, was born and photographed a red hill near Brandon, Mississippi, then sent it to Karen Bourque of Church Point, Louisiana, who has rendered many of the wonderful glass pieces for covers of my books of poetry. Almost immediately, I was assailed with doubts about writing a book about them and announced I was finished before I began. However, when I returned to Louisiana from my spring/summer stay in Sewanee, Tennessee and met for dinner with Karen and her husband, Darrell, former poet laureate of Louisiana, Karen gifted me with Brown Cotton, Red Hills, a wonderful glass piece. Karen gently placed her feet at my back, along with those deceased family members who had appeared in my dreams, and I began writing Sifting Red Dirt. Although it is among 46 books I could not have written without the support of Dr. Victoria I. Sullivan, owner of Border Press, during the last ten years Karen has become an intuitive co-creator in my work. 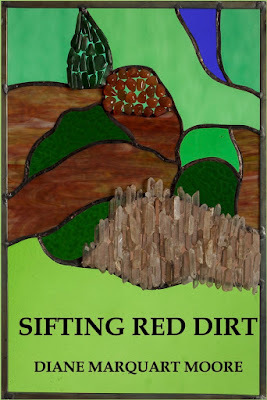 Her glass pieces hang in my home in New Iberia, Louisiana and in the cottage at Sewanee, Tennessee, and one of the poems in Sifting Red Dirt is about her work." 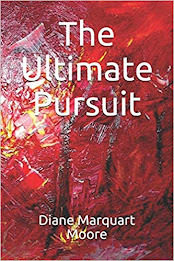 Dr. Mary Ann Wilson, professor of English, University of Louisiana at Lafayette, best describes the poems in Sifting Red Dirt on the back cover as "resist[ing] an easy nostalgia but instead drill down to the core of feeling and memory...the poetry "taking us to the sources of personal and cultural identity — family and place..." Also, Dr. Darrell Bourque endorses the volume with a comment about the poems concerning "our mostly buried lives that shape us and define us in ways that are hardly explicable...Diane's story would not have been complete without those memories rising into language..."
Karen is working on another glass piece to illustrate one poem I've written about Prairie des femmes, Louisiana that will be among photographs of two or three glass pieces she created for my book covers. The photos will be featured alongside several of my poems in the fall/winter issue of Pinyon Review. One of Karen Bourque's glass pieces is permanently exhibited in the Ernest J. Gaines Center, an international center for scholarship about the work of Gaines at the University of Louisiana at Lafayette; another was featured at the Louisiana Book Festival in Baton Rouge, Louisiana, and many hang in homes and churches throughout Acadiana. Her notes about the photographs of glass work on the covers of my books of poetry have appeared in several volumes and could be classified as "prose poems."